Helmet for kiteboarding, windsurfing and wakeboarding. Suitable for all types of water based activities. ION Hardcap 2.0 Wake helmets have high-density polyethylene shells for durability and lycra water-resistant lining for multiple impact protection. The shell of the ION Hardcap Wake helmet has vents for air and water flow. The ION Hardcap Wake features removable Cupping Ear Guards with water channels and padding around the ears to improve ear protection. The ear pieces are removable using simple popper attachments. Stainless steel rivets and soft tubular webbing complete the quintessential package. 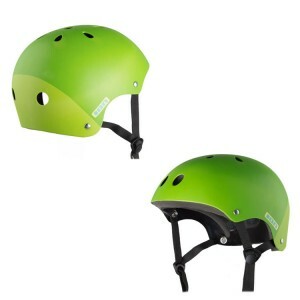 ION Hardcap Wake Helmet features a patented multi-impact helmet technology that is ideal for the aggressive riding style of action sports athletes. - Dual Density Waterproof EVA: lightweight and waterproof - meets CE EN 1385 Water Sports Safety Standards. - Cupping Ear Guards: removeable Cupping Ear Guards with padding around the ear to help prevent riders from blowing out their ear drums when they hit the water at high speeds. The ION Hardcap Wake 2.0 helmet is a vented multi sport helmet with an EVA Foam lining suitable for all water kiting activities. Technology: The ION Hardcap 2.0 Wake EVA helmets are low profile and light in weight. EVA liner meets the industry standard for water sports safety standards.